The Saga of Beowulf is the first complete and accurate novelization of the epic 10th century Old English poem "Beowulf," chronicling the rise of the emerging Nordic nations, the tragic feuding of their clans, epic battles with mythological creatures, and the final, futile struggle of one man against the will of Fate that made of him a Legend. "Breathtaking in scope and relentless in pace," the story follows the Nordic hero Beowulf as he embarks upon a fateful quest for vengeance against the creature that slew his father, setting in motion a sequence of events that will bring about the downfall of a nation, all the while fleeing from the woman he has sworn to love. Based on extensive historical research and steeped in Norse mythology and lore, the saga unfolds across the frozen fields of Sweden and the fetid fens of Denmark, ranging from the rocky heights of Geatland to the sprawling battlefields of ancient France. Most of us remember reading the Beowulf poem in school, and if you were like me it didn't really do anything for you - yeah it was the earliest piece of fiction written, but what kid cares about that?! Well, this is your chance to re-visit Beowulf and read about the legend in the ideal way - as a superb epic fantasy novel! 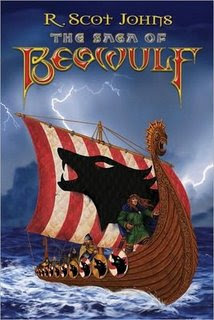 R. Scot Johns has done a remarkable job and The Saga of Beowulf is a novel I really enjoyed reading! Beowulf is filled with extraordinary characters, yet at the same time, are human with real faults and feelings that you as the reader can relate to. The book is rather large at over 600 pages - slow parts creep in there every now and then, but there is enough action to keep you interested and turning the pages! Beowulf has all the essentials that one shgould have in a good novel; love, battles, betrayal, fighting, honor and dragons, I mean a book is not a book without dragons! Thank goodness he includes a Glossery of Proper Names to help you out with the character names...geesh, I though Welsh names were hard! But it was pretty fun to try and pronounce them first - kinda became a game in my head! It is obvious that R. Scot Johns researched the heck out of this book and the passion of his writing shows throughout the novel. I'm intrigued as to what he will write next. Bottom line: I was a little nervous about this one, but only because I read mostly historical fiction and this is more historical fantasy. However, I am very glad to have read it and found myself liking it better than I thought I would. I recommend this to any history or fantasy lover! R. Scot Johns is a life-long student of ancient and medieval literature, with an enduring fascination for Norse mythology and fantasy epics. He first came to Beowulf through his love of J.R.R. Tolkien, a leading scholar on the subject. As an Honors Medieval Literature major he has given lectures on such topics as the historical King Arthur and the construction of Stonehenge, as well as having directed and performed in re-enactments of early medieval morality plays. He lives in Boise, Idaho and works for Books Are Fun, a division of Readers Digest. Click here to read R. Scot John's guest post on Passages to the Past. Man oh man.. I really want to read this one... I was lucky to revist Beowulf in College a few years ago.. (yeah yeah.. I am still in school 25 years later..) It is cool and interesting. This seems like a must read book. Great review. Thank you so much for the kind review. I'm pleased you found the read enjoyable, and I hope the historical passages proved intriguing. I did, indeed, do a fair amount of research, as I find the earliest beginnings of these European nations fascinating, and not often treated. I hope all is well with you, and wish you all the best. Great review. Always good to see a book set in this neglected period!